I have written about art in a variety of mediums, but Eleanor White’s recent work on paper currently on display at the Matteawan Gallery in Beacon, NY is probably the most unique. White incorporates crushed egg shells and wood ash into paint resulting in a beautiful but gritty texture. 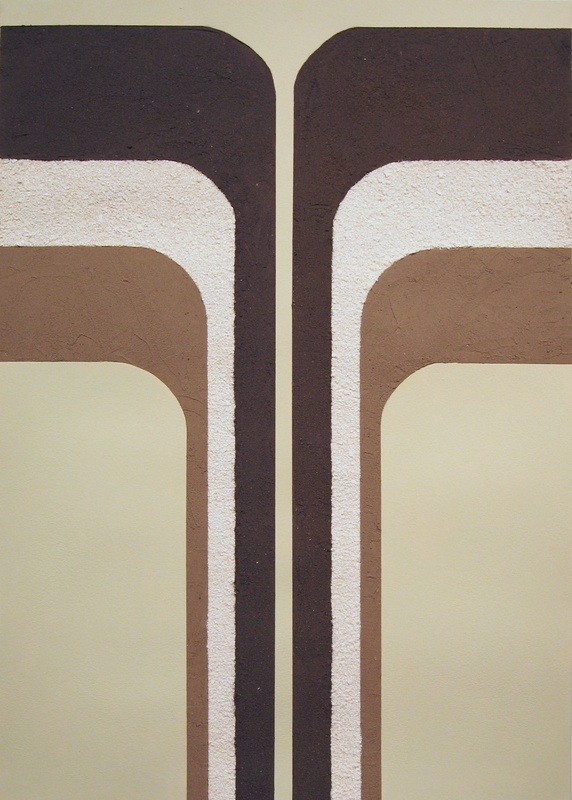 Minimalism and 1960’s and 1970’s design are references for the artist and lead to the geometric qualities of the work. In this first drawing, “Untitled” from 2015, there is the obvious reflection symmetry with the line of symmetry running vertically through the center of the work. There is also the interesting visual effect of the thickness of the parallel bands of color. Narrow vertical section blend into thicker horizontal bands. This next drawing is all about circles. 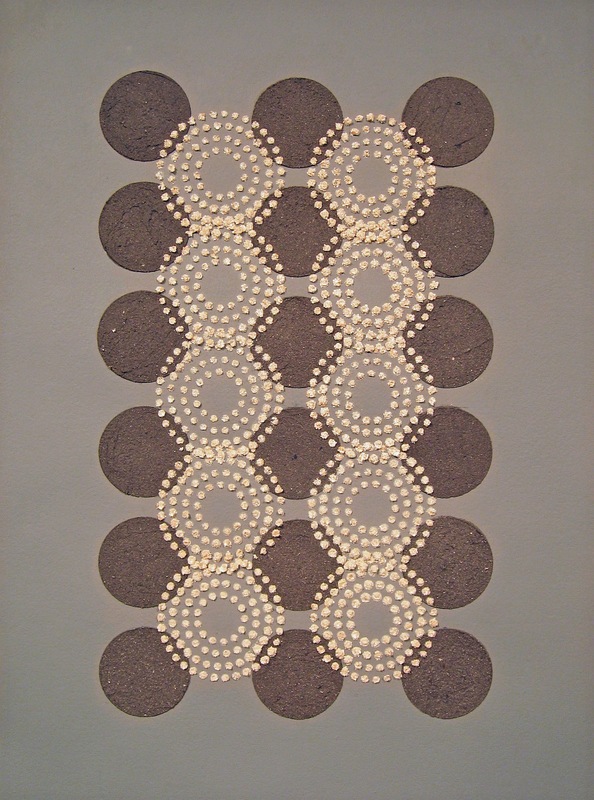 It features a top layer of a 2 by 5 grid of slightly overlapping sets of 4 concentric circles. Each circle composed of dots of ground egg shells. The inner circles have 13 dots, then 20, 27 and finally 34 dots in the outer circle. The underlay of circles is a 3 by 6 grid of solid circle. The 2 by 5 grid packs elegantly on top of the 3 by 6 grid. It is an excellent illustration of how the proportions 3:6 relate to the proportions of 2:5. White’s work has a lot of geometric and numerical mathematical elements. There is also a more subtle theme in the shapes of the tiny bits of crushed egg shells. The original oval 3D shape of the egg has been fractured and spread across the flat plane of the paper. But if you look closely you can still see tiny bits of the curved planes. These optical remnants of the original eggs give these drawings a complex surface that is inspired.